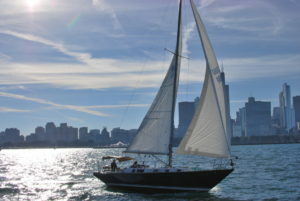 Our Morgan 42 and Islander 36 cruisers offer offshore cruising capability in a larger boat with larger cockpits and more cabin space for extended exploration of Lake Michigan's harbors. 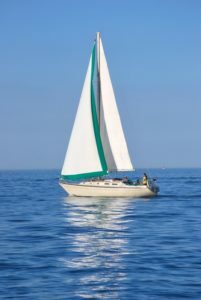 Rigid gas-powered boom vangs stabilize the mainsail in light air and facilitate safer mainsail reefing when wind speeds make things interesting. Push-button electric heads are just one of many conveniences your guests will enjoy. When Lake Michigan winds and waves kick up, these are boats designed to meet the challenge and make the captain smile.